Clearly jealous over all the attention Disney World's been getting for its mac 'n cheese cones, Disneyland Paris is retaliating with its very own signature potable. To properly toast its new Ratatouille attraction, the French theme park has teamed up with Champagne Lanson to create a custom bottle of bubbly for Remy, aka the only rat you want to see in your kitchen. The Cuvée Spéciale Disneyland Paris will be available in park hotel boutiques for about $82 a bottle. Featuring Pinot Noir and Chardonnay grapes, the Champagne is supposed to reflect the personality of Remy, which we guess means the bouquet will be decidedly "sewer-esque". 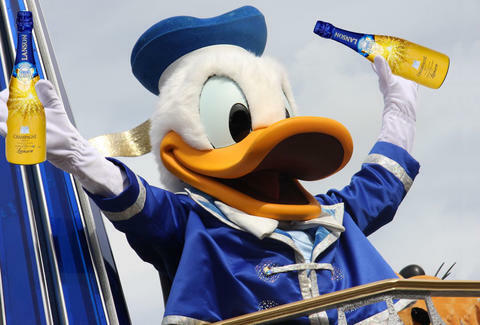 Disneyland Paris is hoping the booze will do serious work to get them out of some long-running financial problems, so here's hoping it sells. But if they still need extra cash, we're sure Cinderella's in-laws could spot them. Kristin Hunt is a Food/Drink staff writer for Thrillist, and wonders if they'll make mead for one of her personal Disney favorites, Hercules, next. Follow her to sing-alongs with the Muses at @kristin_hunt.